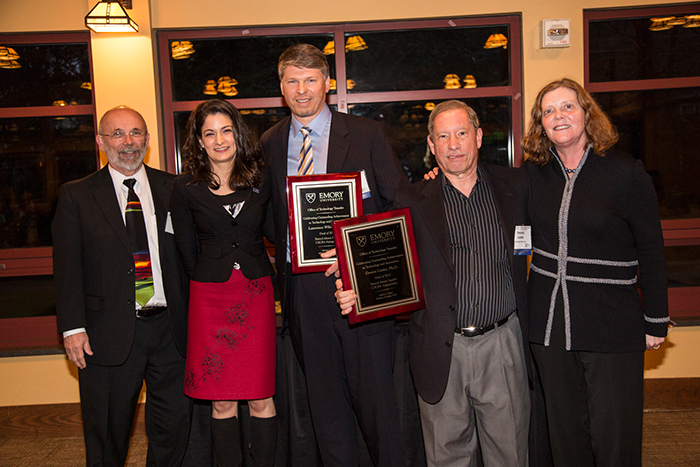 The 10th Annual Celebration of Technology and Innovation honored the work of faculty entrepreneurs. 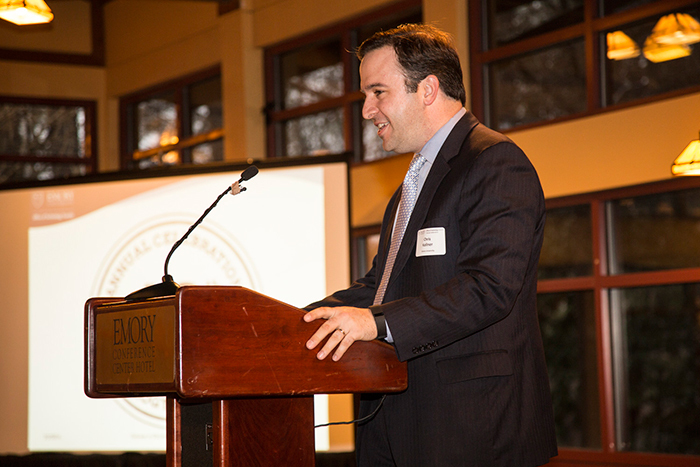 Chris Kellner, associate general counsel, was among the speakers at the March 3 event. The award for Deal of 2015 went to Bristol-Myers Squibb – CXCR4 Antagonists, led by Dennis Liotta (chemistry) and Lawrence Wilson and Michael Natchus (Emory Institute for Drug Discovery). 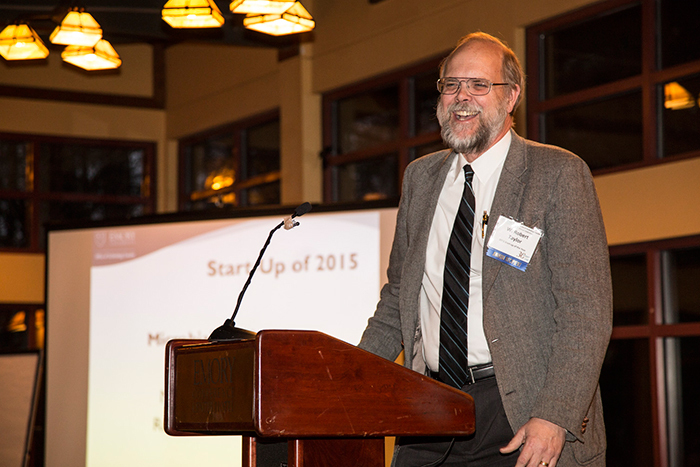 W. Robert Taylor spoke on behalf of Microbial Medical Inc., which won Start-Up of 2015. 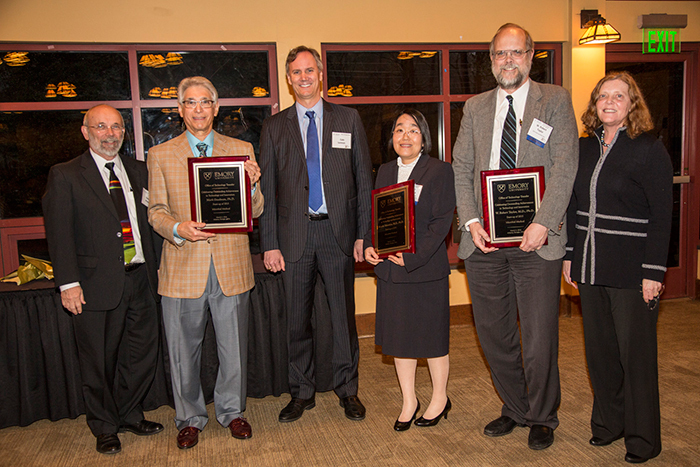 Honorees for Microbial Medical, Inc. included Mark Goodman (radiology), Kiyoko Takemiya (cardiology) and W. Robert Taylor (cardiology). 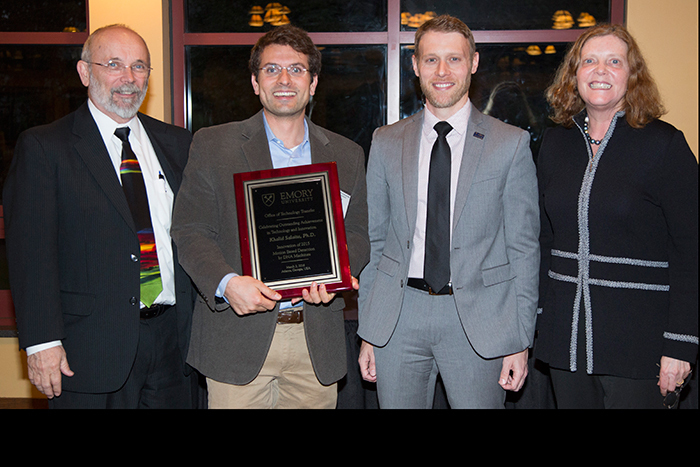 Khalid Salaita received the award for Innovation of 2015 for his work on motion-based detection by DNA machines. Honored as the Significant Event of 2015 was Eurofins Scientific's 75 percent acquisition of EGL Genetic Diagnostics, LLC, represented by Madhuri Hegde (human genetics). 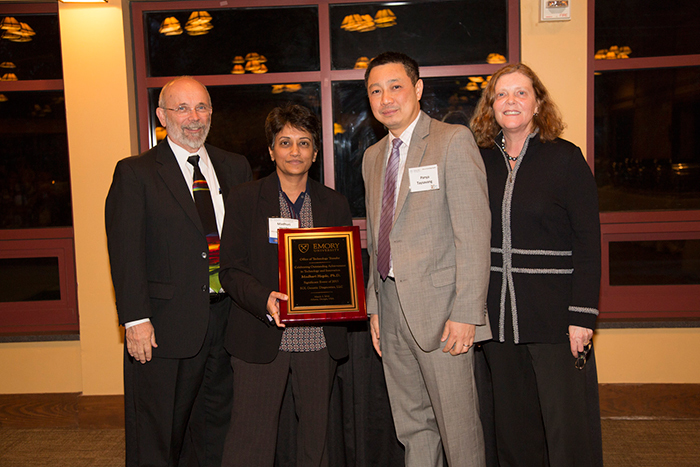 Emory's Office of Technology Transfer celebrated faculty entrepreneurs and their innovative discoveries at the 10th Annual Celebration of Technology and Innovation, held March 3 at the Emory Conference Center. Microbial Medical develops imaging agents for the non-invasive detection of bacteria in humans. Although numerous imaging strategies have been developed for diagnosing infections, none can accurately detect early stage infections or distinguish between infection and inflammation. The inventors developed a technology that uses maltodextrins — sugars that target the maltodextrin transporter, which is uniquely present in all bacteria but not in areas of inflammation. The company’s product pipeline includes novel imaging agents and drugs for diagnosing (using common medical scanners) and treating bacterial and fungal infections. 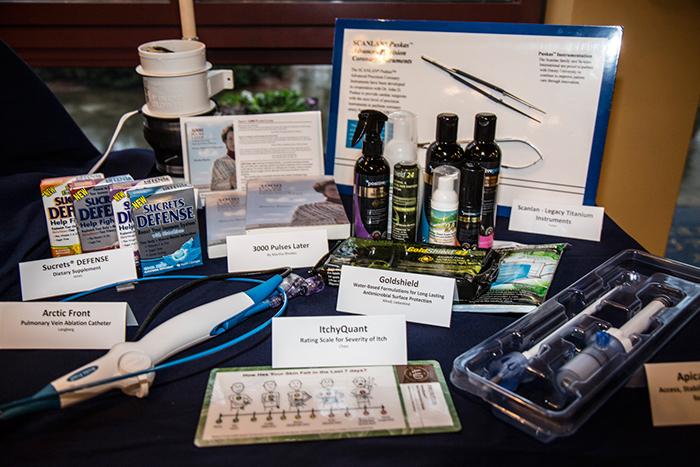 In 2015, Emory executed a high net worth license with Microbial Medical for the technology. CXCR4 protein expression is low or absent in many healthy tissues, but it was shown to be expressed in more than 20 types of cancer, including prostate, ovarian and breast cancer, and melanoma. Emory researchers have developed small molecules that act as antagonists to CXCR4 and may be orally administered. CXCR4 antagonists are known to block adhesion, replication and outgrowth of HIV and can mobilize white blood cells. In 2015, Emory executed a high net worth license for the technology and research collaboration with Bristol-Myers Squibb. Single Nucleotide Polymorphism (SNP) genotyping is the screening and analysis of genetic variations of SNPs, which are common in all species including humans. SNP genotyping and analysis technology can analyze thousands of SNPs and has the potential for whole-genome genotyping. DNA-based machines have potential in several applications and industries, but DNA machines called “walkers” are challenging to work with due to their low fidelity and slow rates. Emory inventors have developed a DNA-based machine that converts chemical energy into controlled motion. Because these DNA-based machines “roll” rather than “walk,” they are able to surpass the maximum speed of existing DNA motors by three orders of magnitude. This technology can serve as a new and powerful tool in SNP genotyping, as well as other applications in diagnostics, drug delivery and biomaterials. Emory Genetics Laboratory (EGL) was founded at Emory University in 1970 as a component of the Department of Human Genetics. EGL provides high-complexity molecular, biochemical and cytogenetic testing for rare and common genetic diseases and disorders, serving more than 400 institutional clients, including hospitals and other commercial laboratories in the U.S. and globally. As the first academic laboratory to bring Next Generation Sequencing technologies to the commercial clinic market, EGL remains a leader in cutting-edge genetic tests, with “first-to-market” tests comprising more than 80 percent of its portfolio. In 2015, Eurofins Scientific, the global leader in bio-analytical testing, and one of the world leaders in genomic services, acquired a 75 percent stake in EGL for approximately $40 million. With the acquisition of EGL, Eurofins is expected to further strengthen its pharmaceutical and genomic service offerings and reinforce its development as a leader in specialty clinical testing services for hospitals, clinicians and pharmaceutical companies.